This scarf is absolutely perfect for men! 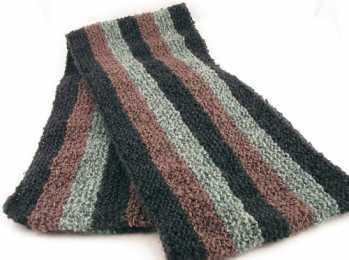 Knit in 3 classic colors, this scarf will go with his brown or black leather jacket, his brown, black or grey wool coat, or his green or black raincoat. Of course, you may knit this in a combination of other colors for women and children too! Knitted Measurements: Approx 66" x 8 "
With A, bind off all stitches.